On the day when Georgia officially announces Jeremy Pruitt as its new defensive coordinator/secondary coach – the same day! – Alabama shuffles its staff to give Kirby Smart the exact same roles. … For better or worse, Jeremy Pruitt was Georgia’s first and only choice. Think about it. At the earliest, it would have been Sunday before Mark Richt could have turned his attention to hiring a replacement for Todd Grantham. It wasn’t until after Georgia’s basketball game against Alabama that the Bulldogs were informed of Grantham’s offer from Louisville, and Grantham said he needed some time to think about it. quickly replied that they would be making not attempt to match it. By Monday night, Pruitt was in Athens and he was the Bulldogs’ coach by lunchtime Tuesday. This wasn’t the result of some long-range plan. It sounds like an opportunity arose, Friend reached out to Pruitt and Pruitt grabbed it. 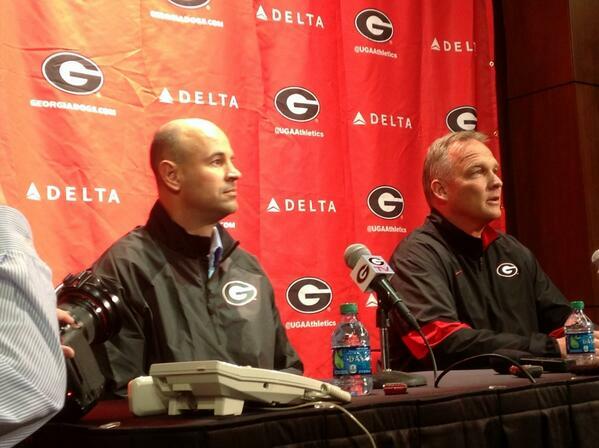 What made the deal go was that Jeremy Pruitt really wanted to coach in Athens. But multiple times, Pruitt said the main reason he’s now at Georgia was, “the guy sitting next to me right here,” referring to Richt. They’d first met when Pruitt was a high school assistant and brought over a couple of prospects from Ft. Payne High. “I said then that was somebody I wanted to work for if I ever got a chance,” Pruitt said. As for leaving the FSU and Jimbo Fisher, for whom he worked only one year and won a national championship in that one, Pruitt was succinct in his explanation. “Coach Fisher and me are good friends, but when I decided what I wanted to do, I let him know and that was it,” Pruitt said. I admit that one of my first thoughts hearing the news was that if Pruitt lives up to expectations, it’s hard to see him with the program beyond his three-year deal. That’s probably still true, but maybe this is the beginning of a beautiful longer-term friendship. In any event, it’s good to have another guy on staff who wants to be there. In this climate, even Kevin Ramsey, who was so incompetent as UGA defensive coordinator in 1999 that he allegedly was relieved of his duties at halftime of the bowl game and subsequently supposedly punched out Bulldogs head coach Jim Donnan, could land a new gig (with a higher salary, natch) within 48 hours. Believe it or not, there are other happenings in the world of college football beyond the Pruitt hire. Georgia Tech’s AD has a four-hour meeting with Paul Johnson, declares the genius to be “as focused and energized as he has seen him”. As long as you keep him on the job, I’m fine. You know how the NCAA keeps vowing to take litigation all the way to the Supreme Court? Well, you can take the litigation to the Court, but that doesn’t mean the Court is going to accept the litigation from you. Damon Evans has a new gig. James Franklin says kids commit to a coach, not the school. Funny how that works out when a coach leaves the school freely while a player is blocked from transferring. Speaking of which, they’re not making that any easier. John Infante looks at the new NCAA governing proposal designed to give the big schools more autonomy and notes the curious absence of the word “amateurism”. Maryland AG counterclaims in the ACC suit, alleging that ESPN provided “counsel and direction” to the conference as it attempted to poach teams from the Big Ten. Pass the popcorn, please. Brian VanGorder, on the lessons he learned from Rex Ryan.